The Digital Research Library of Illinois History Journal™: The Rainbo Building's History, 4812-4836 North Clark Street, Chicago, Illinois. The Rainbo Building's History, 4812-4836 North Clark Street, Chicago, Illinois. An In-Depth Look at the History of the Rainbo Building Starting from 1894. The Rainbo building (yes, 'Rainbo' is the correct spelling) on Clark Street and Lawrence Avenue has a long history of businesses and nightclubs, way before the ice skating rink and then the roller skating rink we all remember. As early as 1894, the site was occupied by a small roadside restaurant that likely enjoyed a robust business. After all, the roadhouse had a prime location. 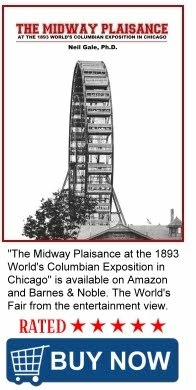 It was situated alongside what was then still the main road between Chicago and the northern suburbs, Clark Street (formerly: Green Bay Road), and stood across the street from one of the city’s largest cemeteries, St. Boniface. Like many of the other picnic groves that operated across the city’s northern periphery during the late nineteenth and early twentieth centuries, the Clark Street roadhouse would have offered weary travelers and cemetery visitors a welcome place to stop and refresh themselves before continuing their journeys or returning to the city. There was food in the restaurant, drinks in the tavern, and a spacious picnic grove out back. Two lengthy horse sheds provided visitors a place to hitch their horses and park their carriages. During the next twenty years, urban growth gradually engulfed the Clark Street roadhouse. As the area grew, the roadhouse changed. By 1905, its owners had added a second floor to the restaurant and erected a two-story beer hall, a bowling alley, an outdoor dance floor, and several stand-alone refreshment stands. These new amenities helped transform the old roadhouse into an urban amusement center. Whereas the old nineteenth-century roadhouse had catered to travelers and cemetery visitors whose dining options were limited by the remoteness of the site, the enlarged twentieth-century eatery and outdoor pleasure ground competed with other urban amusements for the business of young, pleasure-seeking urbanites. By the summer of 1917, the pleasure spot had come to be known as the Moulin Rouge Gardens, with D’Urbano’s Eccentric Italian Band heading the bill of entertainers. But owner Fred Mann had bigger ideas. In 1921, he set about giving the old pleasure spot a million-dollar make-over. Plans called for a redesigned outdoor gardens for summertime events and the construction of a two-story structure to house a cocktail bar and dining room that would remain open year round. The rebuilt gardens opened in June 1922. 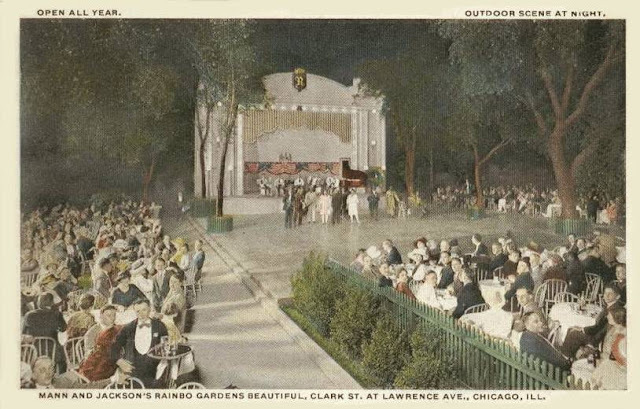 According to a promotional pamphlet, the gardens were “surrounded by a wall with tall trees planted at intervals to provide an illusion of complete remoteness from city life.” Four months later, the Rainbo Casino, housing the cocktail bar and dining room, opened for business. 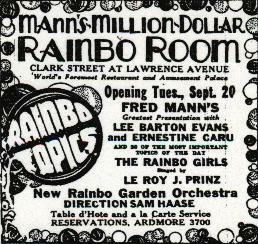 The dining room, known as the Rainbo Room, could accommodate as many as 2,000 diners at a time—plus an additional 1,500 dancers if need be. 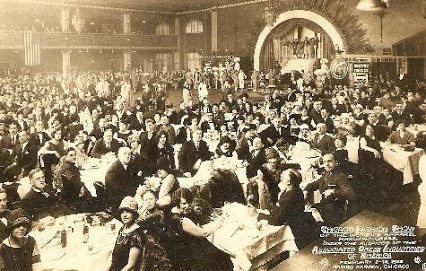 Variety said it was “probably the largest cafe in America conducted strictly on a dine and dance basis.” Indirect, multi-colored lighting gave the Rainbo Room a romantic glow and a revolving stage ensured that the entertainment—be it vaudeville, ballet, or dance music—never stopped. Some of the biggest names in Chicago night life performed at Rainbo Gardens during the early twentieth century. During the late 1910s, singing sensation Ruth Etting performed there after having made a name for herself as a costume designer at Chicago’s Marigold Gardens. She wowed audiences at the Rainbo Gardens with her deep singing voice and her eye-catching chorus-line costumes. Before leaving for Hollywood, many Chicagoans had come to know her as “Chicago’s Sweetheart.” Musicians were also an important part of the Rainbo Gardens during these years. Renowned saxophonist Isham Jones led one of many so-called Rainbo Orchestras while performing at the Gardens during the early 1920s. Jones’ Orchestra thrilled the Rainbo’s dancers with snappy jazz pieces like “Dance-O-Mania” and “Jing-A-Bula-Jing-Jing-Jing,” as well as more romantic tunes like “I Love You Sunday” and “Sahara Rose.” Among the other band leaders to perform at the Gardens during the 1920s were Frank Westphal, Ralph Williams, and Sam Wagner. Despite the top-flight entertainers, Rainbo Gardens, like many of the city’s other night spots, struggled during the years of Prohibition. The ban on the sale of alcoholic beverages took much of the excitement out of the place. Patrons responded by smuggling their own flasks of liquor into the Gardens and sharing with one another. Rainbo’s managers, not unlike their counterparts at other Chicago night clubs, usually turned a blind eye to the surreptitious liquor consumption, not willing to risk driving away patrons. Federal prohibition agents, however, were not so tolerant. One of the first big raids came in October 1920, when federal agents stormed the Rainbo, along with the nearby Green Mill Gardens (Jack McGurn of Al Capone's Chicago Outfit became a part-owner of the Green Mill and became Capone's north-side hangout. There was an access hatch to the tunnels that lead underneath the street to an adjacent building; this was how Capone eluded the authorities when the Green Mill was raided. ), and seized a large supply of liquor at both establishments. The raids continued, off and on, for the next eight years. Mann looked to protect his investments against the uncertainties of Prohibition by diversifying the Rainbo’s range of amusements. In 1927, he converted the outdoor gardens into an indoor sports arena with 1,726 permanent seats. 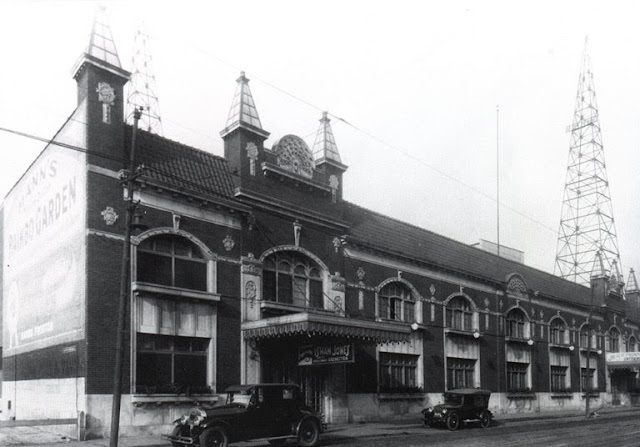 Initially known as the Rainbo Fronton, the arena pushed the Manns’ total investment in the property to over $2 million. At first, the Fronton was used for jai alai matches, the novelty of which attracted the interest of many Chicagoans. For a time, the sports pages of the city’s daily newspapers were filled with jai alai scores and profiles of various Rainbo Fronton players. As the novelty of the sport wore off, however, the Fronton began to be used primarily for boxing and wrestling matches. The facility could accommodate as many as 2500 for the matches by setting up an additional 800 seats on the main floor of the arena. The Rainbo, meanwhile, remained a top target of law enforcement officials. Prohibition agents intensified their efforts in 1927 and 1928. During the wee hours of the morning of February 5, 1928, agents raided the Rainbo and at least ten other Chicago night clubs without the use of search warrants. As Variety reported, “For the first time in the history of local prohibition enforcement, no search warrants were used, and every guest that had a highball glass, ice, ginger ale, or charged waters at their tables were given the once over. Names and addresses were taken and verified before the people were permitted to leave.” Law enforcement officials contended that night clubs functioned as public spaces and could be entered by law enforcement officials without search warrants–even though search warrants had always been used in the past. Fred Mann and other Chicago night club owners, however, challenged such tactics by forming a local trade association and taking prohibition officials to court. They contended that raids conducted without search warrants were unconstitutional and that local enforcement of Prohibition targeted outlying night clubs, like the Rainbo, while ignoring widespread liquor consumption at prestigious downtown hotels. Following the February 1928 raid, federal authorities ordered Rainbo Gardens closed. Soon thereafter, Mann was arrested on gambling charges. Authorities alleged that Mann sponsored illegal pari-mutuel betting at the Rainbo Fronton. In February 1929, with the Rainbo still padlocked, Mann fell into bankruptcy. 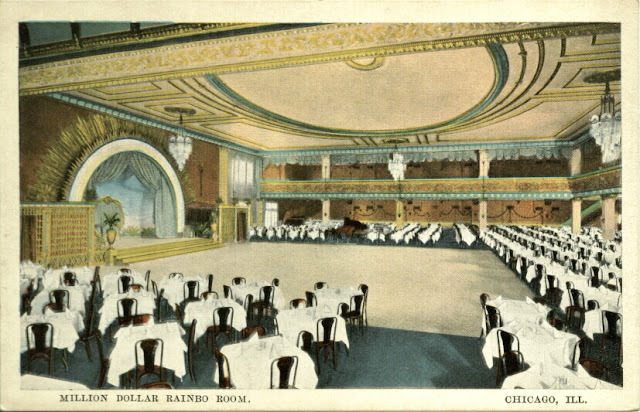 The Rainbo did not reopen until November 1929, with the Charley Straight Band providing the entertainment. Shortly after reopening, a fire forced the Rainbo to close yet again. It reopened in December 1929, after a month of reconstruction and redecorating, but by then many Chicagoans had found other places to enjoy themselves. The Rainbo’s struggles continued during the Depression. Most activity during the 1930s centered in the Rainbo Fronton, where jai alai tournaments and other sporting events continued to draw crowds. A few years later, in 1939, theatrical producer Michael Todd and a group of investors purchased the Rainbo Gardens complex. 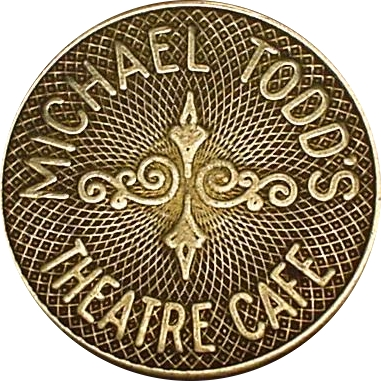 After spending an estimated $60,000 on repairs and new decorations, Todd reopened the old Rainbo Casino, calling it the Michael Todd Theatre Café. The new Theatre Café and its spectacular stage show proved very popular. Upsetting every nightclub tradition, he ran his establishment according to the principles of Andrew Jackson and Abraham Lincoln, aiming the entire operation at the common people. Admission was 50¢, dinner 75¢ (the most popular dessert was Jello); Champagne cocktails cost a quarter, cigarettes cost exactly what they did at any tobacco store and hat-checking was free. The plain people of Chicago loved the Theatre Café to the tune of $65,000 a week. Following Todd’s departure, police raided the Theatre Café and discovered employees selling liquor to minors. The city subsequently revoked the night club’s licenses, forcing it to close yet again. After the Second World War, new operators reopened the Rainbo, holding wrestling matches in the Fronton. A bowling alley was also built on part of the property. An ice skating rink was installed in 1957. It subsequently became a practice rink for the Chicago Blackhawks including the year they won the 1961 Stanley Cup. It also became a training rink for several Olympic figure skaters and housed a pro bowling alley before it became a rock music venue. Aaron Russo originally opened a nightclub called the 'Electric Theatre', but was forced to change the name sometime in the summer of 1968, to the Kinetic Playground, after a threatened lawsuit from New York City's Electric Circus. Gangsters fire-bombed the Kinetic Playground on 11/7/69 and destroyed the roof and light show. The club was subsequently re-opened in the early 1970s. A somewhat circular room with a manned huge projection booth hanging from the middle of the ceiling, filled with fifty automatic film and slide projectors, and strobe lights for the psychedelic light show. The club featured a huge balcony, eight sound towers, a kaleidoscope of full-length mirrors, an amoeba-shaped stage, and meditation booths. One section of the building was originally the Rainbo Fronton (later Rainbo Ice Arena, and Rainbo Roller Rink). This section was used for the sport of Jai lai (A sport involving a ball bounced off a walled space by accelerating it to high speeds with a hand-held device called a cesta, a wicker basket used to catch and throw the ball. ), boxing, wrestling, a 30 lane bowling alley and an ice skating rink. The section of the building that became the Kinetic Playground was originally the Rainbo Gardens ballroom (later restaurant, casino, and bowling alley before it became a rock club). It was directly to the south of the Rainbo ice skating rink. In 1980, the new Raibo roller-rink surface was laid atop the space that for the previous 22 years had been maintained for ice skating. Skating patrons entered the building from Clark Street, then walked down a 100-foot hallway, passing the Rainbo Skate Shop on the way. The shop moved to Skokie and is now located in Northbrook, IL. 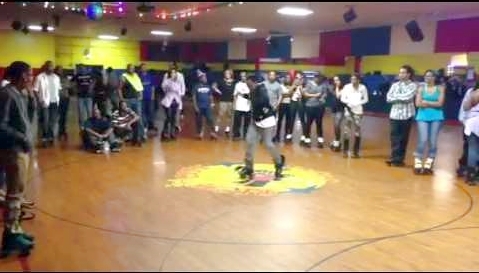 Before it was demolished, the Rainbo Roller Rink was still open to the public. It was primarily a late-night roller skating rink but also hosted some concerts in the rink as well. The last event held in the building was on March 30, 2003, and it was demolished in November of 2003. 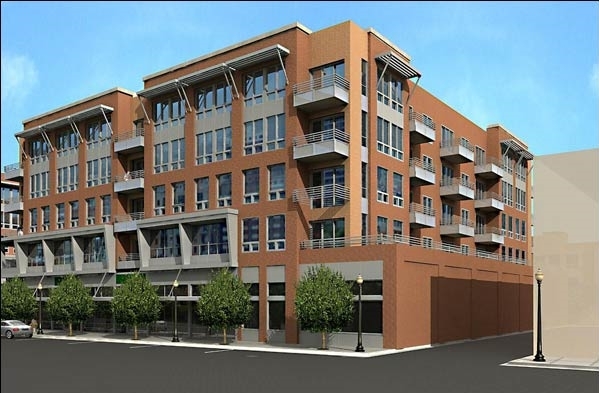 Today there is a new condominium complex where the great Rainbo building once stood. The new condominium complex is named: Rainbo Village. 1894 - Roadside Restaurant and Watering Hole. 1905 - Additions to the restaurant include a 2nd floor, two-story beer hall, a bowling alley, an outdoor dance floor, and several stand-alone refreshment stands. 1917 - Became known as 'Moulin Rouge Gardens'. 1922 - Name changed to 'Rainbo Gardens.' The Rainbo Casino and Rainbo Room were added in a major renovation. 1927 - Outdoor gardens converted into an indoor sports arena called the 'Rainbo Fronton,' and 'Rainbo Arena' (used for jai-alai, boxing, and wrestling matches). 1934 - During the 1934 Chicago World Fair it was known as the 'French Casino'. 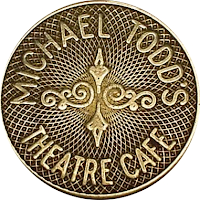 1939 - Michael Todd reopened the old Rainbo Casino and renamed it the 'Michael Todd's Theatre Cafe.' It was closed after a very short period of time when he had a falling out with gangsters. 1940s - A bowling alley added to complex. 1957 - An ice skating rink was added to the facility. 1968 - The Electric Theatre opened. 1968-73 - Name changed to Kinetic Playground due to threatened law suit. 1980 - Rainbo's roller-rink opened. 2003 - The building was demolished for condominiums. Uptown residents will soon hear the sounds of wrecking balls and construction once again, this time claiming the historic Rainbo roller rink, 4812 N. Clark St., to make way for a condo complex. The last group of skaters left the rink around 2:40 a.m. Monday, March 31. Within 24 hours, all 12 of the rink's huge mirror balls were lowered in preparation for the wall-to-wall sale of the building's contents April 2 and 3. In the end, the historical and social value of the rink was exceeded by the property's real-estate value. Rainbo and its parking lot sit on two acres that have seen many entertainment uses over the past 130 years. In the 1870s, a beer garden was built there. 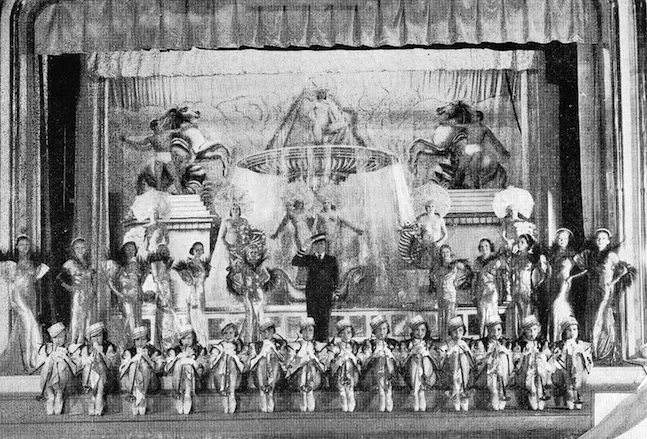 Rainbo's current building dates back to 1922, when it featured a theater/restaurant and an outdoor garden with lavish stage shows. Michael Ross, a former security employee, said that in the 1920s, the building included a tunnel up Lawrence Avenue toward the Green Mill on Broadway, allowing gangsters and other patrons to escape Prohibition-era police raids. 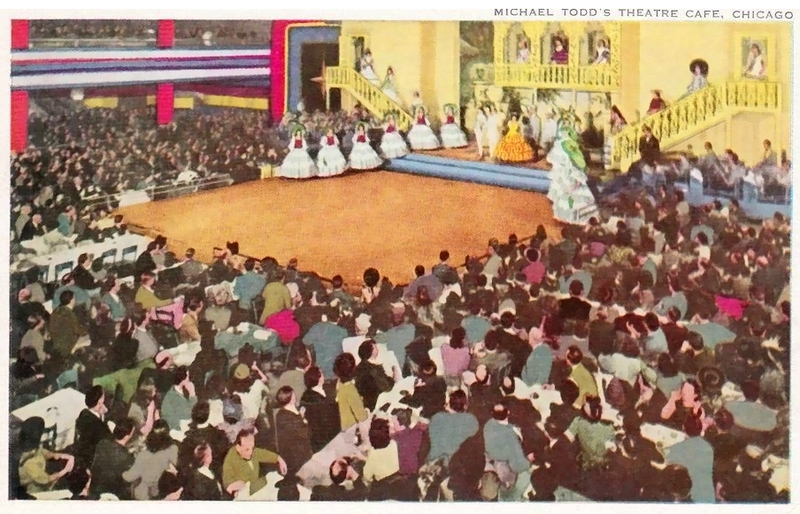 In addition, the building has hosted wrestling, boxing, dog shows, 30 lanes of bowling, an ice-skating rink, and various performance uses from rock concerts to Big Band ballroom dancing. In 1980, the Raibo's roller-rink surface was laid atop the space that for the previous 22 years had been maintained for ice skating. Skating patrons entered the building from Clark Street, then walked down a 100-foot hallway, passing the Rainbo Skate Shop on the way. The skate shop has since moved to Oakton Avenue in Skokie (now relocated to Northbrook, Illinois). As they entered, many didn't realize that to their left was a colossal, vacant, crumbling chamber, whose walls feature neoclassic ornate plaster-work juxtaposed with an Art Deco ceiling of extended and retracted circular platforms. Surrounding the chamber on three sides, 20 feet above floor level, is a wide and deep balcony which suffered fire and water damage. 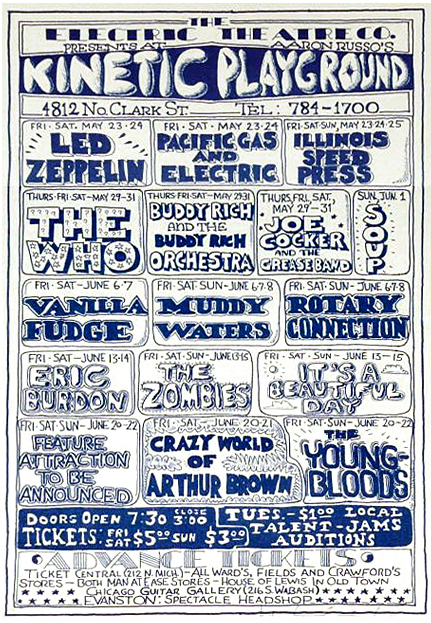 In the 1960s, the forward space of the building was the Kinetic Playground concert venue, hosting such acts as the Rolling Stones and The Grateful Dead. By the late '80s, the former Kinetic Playground space had become one of the area's first skate parks, where skateboarders could navigate obstacles and display their skills on half-pipe-shaped ramps that propelled them nearly as high as the 40-foot ceiling. But with the installation of the skate park came the destruction and removal of the original bar and lower-wall paneling, both made of fine imported woods. The skate park was only used for a few years before it was closed down due to liability concerns. In the 1990s, the U.S. General Services Administration contracted to use the forward space of the Rainbo building for new Social Security offices, but then it halted in mid-construction, leaving the current gravel floor. A fire in the neighboring Crafty Beaver store contributed further to the building's structural problems, according to General Manager Mark Stern. The Rainbo's patrons, staff, and management all gave different reasons for the club's recent demise, but several things are clear: Columbus, Ohio-based United Skates of America, which had owned the building and the business for 22 years, sold the building to a developer in early 2001, but continued to operate the business as Rainbo under their lease agreement. Patrons were notified at the beginning of March 2001 that their beloved rink would remain open for less than 30 days more. 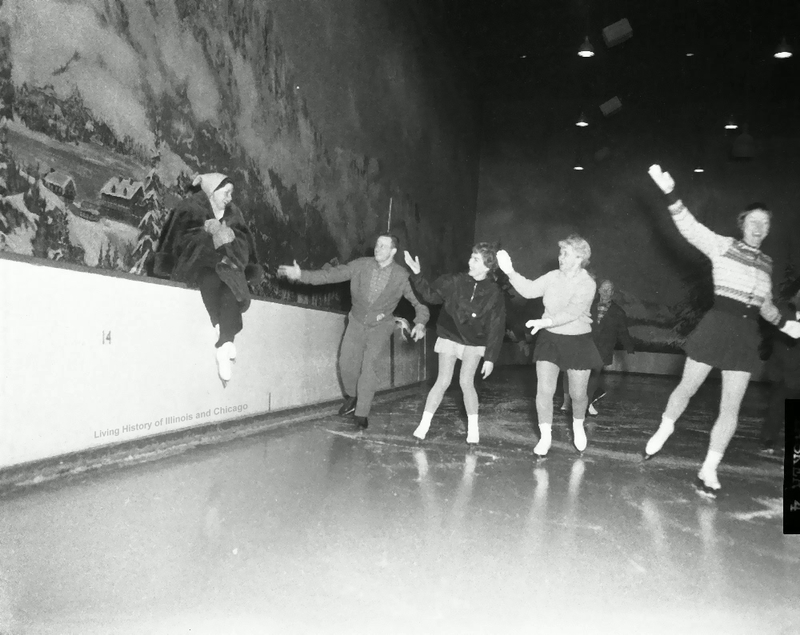 Many of the over 500 patrons who skated on the club's closing night shared stories of growing up and making close friendships inside the Rainbo. "This should have been the last rink of all the rinks to close," patron Jesse Woolfolk said. "I've been skating for 42 years and we had nothing (else) on the North Side as far as skating. So I was here the day it opened. I used to work as a Redi-Mix truck driver. If I was here around lunch time, I'd jump out of my truck and run in here real quick and skate and jump back into my truck and go." "Skating is one thing my wife and I have always had in common, and she's skating here with me tonight." Employees who had just completed their last shift at the Rainbo, including bartender Darnell Harris, blamed poor management for causing the North Side's only roller rink to go out of business. "I started DJ-ing here when they first opened and I left, then I came back here in '84 and I've been here ever since," Harris said. "This (closing) is about bad management. The Social Security Administration was going to put its headquarters in the other side of this building. They reneged on the contract, but they still had to pay. That money didn't come back to keep this place open." Stern confirmed that United Skates' financial benefit from the Social Security contract was not reinvested into improvements at the Rainbo site. Stern also confirmed that the profits from the Rainbo had been used by United Skates to expand into additional rinks around the country, but few of the corporation's profits had come back to improve the Rainbo facility, except that a new game room, party room, and bathrooms had been added on the south side of the building. But the Rainbo didn't close simply because the company had not further redeveloped the property. Stern emphasized that while profits had increased under his management, the roller-rink business was no longer providing its owners with the most profitable use of the property. Stern said they notified the public as soon as they knew their lease was terminating, which forced them to cancel several events that had already been contracted, including Monday night hockey, spring break programming and concerts. Stern dismisses the likelihood of any last-hour preservation attempts, noting that Rainbo had the building for sale for several years before it was purchased by the current owners, who left the rink untouched for over a year. Preservationists could have stepped in at any point, he said. "Where were they three years ago when the building was up for sale?" Stern asked. Jim Dvorak, United Skates president, pointed out that the monies generated from the Social Security Administration's pull-out were on the real-estate side of the ledger and were never intended to go to the skating company. Had the U.S. government agency not abruptly changed its plans, Dvorak said, its use of the other half of the building could have helped keep the Rainbo open. Dvorak encourages Chicago skaters to visit the company's newer rink located at 79th and Racine, which was opened about two years ago. But adults, kids, teenagers, and entire families are unlikely to trek over 20 miles to the nearest open rink. Young people from Uptown and neighboring communities will no longer have that venue as a constructive outlet for their energy. Those present at the Rainbo on the night of its last hurrah will likely remember the amazing moves of men, women and children who were dancing, gliding, spinning and leaping, backwards and forwards, including moves reminiscent of singer James Brown, creating a Broadway-worthy performance that Chicago's North Side may not see repeated for many years to come. Larry Fine was working at the Rainbo Room in 1928, where he was hired by Ted Healy to join what would become The Three Stooges.